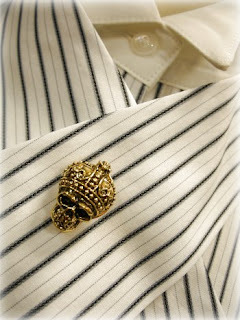 The Flasco blog has been posting images of Excentrique's upcoming Spring 2011 collection over the past week and I am seriously smitten! Once again, they're presenting a blend of classic tailoring, corset details and military styling; the simplicity of the lines reminds of Atelier Boz, although the stripes give a bit more interest than Boz's usual solid colors. 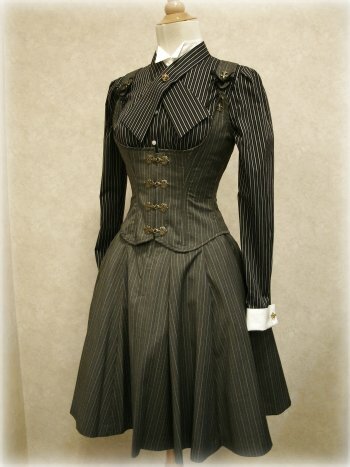 Love the stripes-on-stripes mix in this coordinate, plus the underbust corset - so yummy! From their start as a corsetier, Excentrique has always been very detail-focused. This fantastic ascot pin is replicated in matching cufflink buttons on the shirt. See more here, here and here. I suspect pre-orders have already begun for the collection, since the coat already appears to be marked as "sold-out" - hopefully there will be a few pieces left in the shop to paw over by the time I arrive!